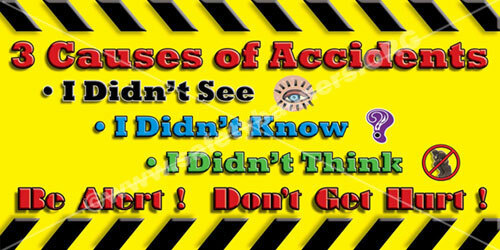 Causes of Accidents safety banners and safety posters. 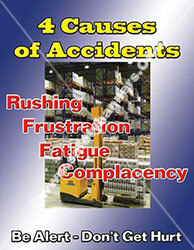 The most common causes of workplace accidents are human errors. Humans are notoriously lazy, so taking shortcuts is a rather common practice in all walks of life, not necessarily work alone. However, when workers take shortcuts at work, especially when they are working around dangerous machinery or lethal chemicals, they are only exposing themselves to a potential catastrophe. Simply put, shortcuts that are taken on the job are not actually shortcuts. They are simply increasing your risk of injury, or worse, death. Confidence is always a great thing to have, but there is also such a thing as too much confidence. When workers walk into work everyday with the attitude that, “It will never happen to me”, they are setting an attitude that leads to incorrect procedures, methods, and tools while working. Be confident, but remember that you are not invincible. Whenever someone walks through your workplace, they can get a pretty good idea of your attitude towards workplace safety by just looking at how well you’ve kept up your area. Housekeeping is one of the most accurate indicators of the company’s attitude towards production, quality, and worker safety. A poorly kept up area leads to hazards and threats everywhere. Not only does good housekeeping lead to heightened safety, but it also sets a good standard for everyone else in the workplace to follow. The quickest way to get a job done is to do it right the first time. To do it right the first time, you need to make sure that you have any and all pertinent information relating to the task you will be performing. Workers who begin a job with just half the information, or half the instructions, are essentially doing the job while blind. Deliberately neglecting set safety procedures in the workplace doesn’t just endanger yourself, but it endangers the workers around you as well as the company as a whole. Casually following safety procedures doesn’t work either. 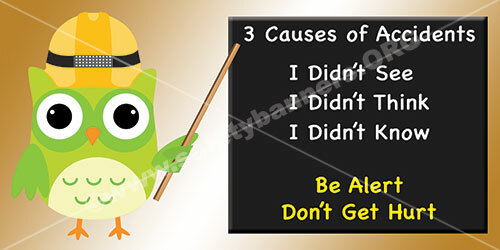 You are paid to follow workplace safety procedures, not your own. 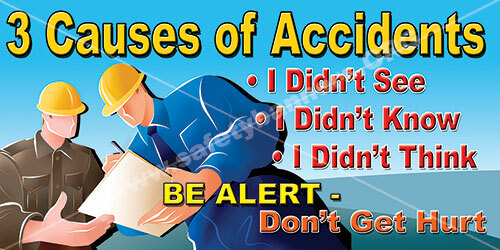 Use safety banners to keep causes of accidents in front of your workers.